We're happy to have Carol Ann Didier joining us today as she promotes the release of her latest American Indian romance from Kensington, NAVAJO NIGHT, set in 1860 New Mexico Territory. She's written us a lovely description of her journey into publishing. Stay tuned at the bottom of the post to learn what goodies Carol Ann is giving away! I am so pleased and honored to be able to blog with you on this exciting website. Someone asked me how I became so interested in Native Americans that I would write about them. This was my reply: "At twelve years of age, I fell in love with a dead actor who had played a dead Indian." It was movie star Jeff Chandler who played the part of the Chiricahua Apache leader, Cochise, in the 1950 movie BROKEN ARROW. After that, every term paper or book report I did in school was about our westward expansion and Apache Indians. I never planned to be a writer, but I loved to read about our westward expansion and the stamina and determination of our early pioneers that carved a life out of what was once a wilderness. But later in my life, after a divorce and a move from Maryland to Florida to raise my two sons, I found myself reading Native American romances to ease the loneliness at night. Later, through a meeting with some wonderful pastors and missionaries to the Apache and Navajo people, I was able to visit the very places I had read about. For ten years I spent all my summer vacations on the Apache and Navajo Reservations and attended Native American Pastor convocations. I met many wonderful Apache and Navajos, as well as people from other tribes. I was grieved and touched by the poor living conditions on the reservations and was appalled that we would let the real First Americans live like this in this day and age. That started my empathy and love for them as a people. One day in l982, while my son and I were getting ready for work and school, a famous romance writer was on the TV show "Good Morning America" discussing her latest bestseller. I turned to my son as we passed each other in the living room and said, "I've read her books, and I know I could write one every bit as good as hers." My son answered, "If you think you can, then do it." He put the dare before me and I just had to prove that I could. So I wrote the first book in three months. I had not realized how much of the things I had read and learned about the Apaches and Navajos had stayed with me all these years. When I started writing, I knew the story would have to include Cochise, the mighty Chiricahua Chief, even though he could not be the love interest of my white heroine, Amanda. It's a romantic historical saga about an Eastern Baltimore belle and an Apache warrior caught up in a taboo love that has the power to heal or harm a broken people. 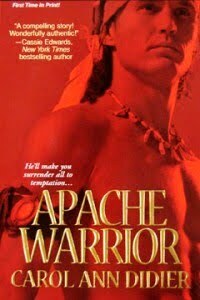 Set in historical southeast Arizona of l860-1880, APACHE WARRIOR proved love knows no color, creed or race. It happens in the heart, when and where you least expect it and if allowed to grow, can conquer differences in culture, hatred, and personal loss. My second book for Kensington came out this past September, called NAVAJO NIGHT. While I was researching the Dinéh, The People, I discovered a not so well known fact concerning one of the darkest periods in their history--something they called "The Long Walk." It was very similar to the tragic "Trail of Tears" made by the Cherokee when President Jackson forced them to leave the Carolinas and Georgia and marched them to Oklahoma/Indian Territory. When I read about it, I knew I wanted to include that in my story as well as the taboo love between a Navajo holy man and a Virginia preacher's daughter. In 1860, because of complaints about Navajo raids on white mining camps and ranches in New Mexico that General James Henry Carleton commissioned Colonel Carson to round up the Navajos. It was Carleton's shortsighted belief the if the Navajo were instructed in the benefits of becoming more like the white man, they could be civilized, Christianized, and eventually fit in to the white society. Kit Carson, having made friends with the Navajos in earlier days, feared it would not be an easy task. Nor was it. He finally resorted to a "scorched earth" policy whereby the army burned their villages, destroyed their farm plots and peach orchards, killed their livestock or took them, and literally drove The People like cattle south from the four corners area. It was grueling march of over 400 miles. Many Navajo died from disease, lack of proper food and clothing, horrible weather conditions, as well as mistreatment by the army itself. Once on the reserve, the ones who survived felt those who had not actually received the better end of it. Into this struggle a man and a women from two different worlds try to find a bridge between two life-ways, to again prove that love knows no color, creed, or race. The question then became, could the Navajo holy man with a crippled heart, heal the white woman with a crippled foot? In all my novels, I have tried to make them as historically accurate as I can, especially in dealing with the beliefs and cultures of the Native Americans. I try to use familiar settings and actual figures from history to make it more authentic while creating my own characters and love story. For those who wish to write, I would say "Get to it!" Don't let go of your dream. Write that book of your heart. It may not be the one that sells at first, but it feels so good to see in on paper and type THE END when finished. I was not an overnight wonder. It took me ten years to get published, but in the end, when I walked into K-Mart and saw my book staring me in the face, I wanted to shout and jump and down and grab the first passerby and say, "Look! Look...it's my book on that shelf." Of course, I didn't do that, but I did have to restrain myself when a person came down the book isle shortly thereafter. I encourage you to just read, read, and read some more. Keep up with your favorite genre and see how the books you love are being written. 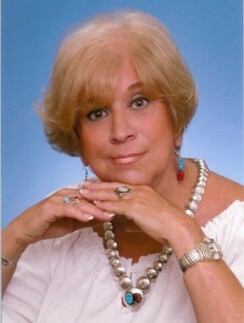 Join a writer's group like Romance Writers of America or one in your area. Find a critique partner(s) and go to conferences that specialize in developing your writing skills. You'll find great encouragement being with like-minded persons. Thanks for taking the time to read my posting. I hope you will pick up a copy of both books and find your own time under an Apache moon and enjoy a Navajo night. Thanks for sharing with us, Carol Ann! Leave a comment or question for our guest author and you'll be entered to win a nice little gift package. Carol Ann is giving away an autographed copy of NAVAJO NIGHT, a bookmark, and an engraved pencil. I'll draw the winner next Sunday. Void where prohibited. Best of luck!